DESCRIPTION: Figure 1 is a CSA patriotic cover of blue, red, and white all-over 7-star CSA Stars & Bars Flag design, franked with a single U.S. 3 cent 1857-61 Issue stamp, canceled with a black CONCORD/APR 7/N.C. circle date stamp and addressed to Greenville, S.C. 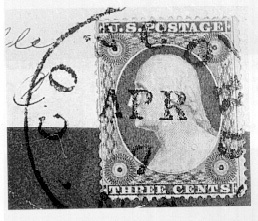 APPARENT USAGE: Letter rated at 3 cents per half ounce mailed April 7 (1861) during the period when U.S. postage stamps were still valid in CSA North Carolina, that is, until June 1, 1861. ANALYSIS: An initial examination of this cover reveals a postmark that is apparently identical to known Concord, N.C. markings used from 1857 to 1867. The color of the ink of the marking is also in line with known genuine examples, although under magnification (see Figure 2) it appears somewhat mottled, which can be a characteristic of a fake. Texas entered the Confederacy in March of 1861, becoming its seventh state. This seven star patriotic reflected Texasâ entry. Figure 2. Close up of the circle date stamp showing the mottling of the lettering & the suspicious dot between the “C” of Concord & the “N” of N.C. 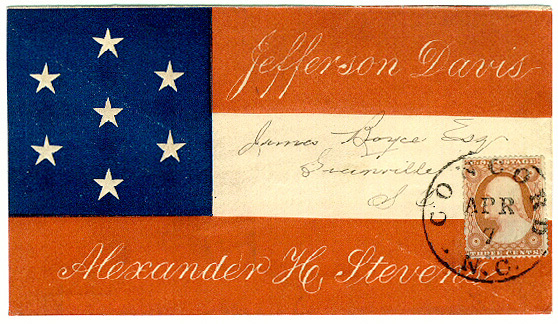 In researching the design of the cover at Figure 1, one notes that three varieties of all-over design, 7-star flags with the names of Jefferson Davis and Alexander H. Stevens annotated within the bars of the flag are known genuinely used in the CSA. Each of these varieties are seven stars in a circle — of which 23 examples of these covers have been recorded. No examples have been recorded used in the CSA of the particular variety shown in Figure 1 with the seventh star located in the center. However, post-Civil War unused examples of the center star variety are known. In Benjamin Wishnietskyâs book, Confederate Patriotic Covers and Their Usages, he illustrates several examples of known fake patriotic covers. His first illustration is one of an overall design 11-star flag with a pair of genuine CSA 5 cent lithograph stamps tied by a Griffin, GA circle date stamp. This cover is addressed to the same individual, James Boyce Esq., as the cover in question. It is also addressed in the same hand — a near identical match. In examining the handwriting on the subject cover under magnification, one finds a telltale trait of the faker. There are breaks in the handwriting in seemingly unnatural places, an indication the writer was laboring to exactly copy a handwriting style. Two examples of these breaks can be seen before the “e” in James and after the “r” in Greenville. Other suspicious signs are the “Esq.” placed after the addresseeâs name, the cover neatly opened at left, and the note on the reverse of the cover that indicates it was purchased from “Fox 9/63 for $400.” John A. Fox was a known distributor of faked philatelic covers, operating a successful New York dealership from 1953 until 1966. He was known to place “Esq.” after the addressee name on many of his fakes and sometimes to have them opening at left. Some believe these may have been keys to himself to warn against possible future repurchases. In any case, John Fox denied until his death in 1988 that he ever produced a faked or forged item. However, his stock did contain a large number of questionable items. This fact came to public attention as the result of a sheriffâs sale of John Foxâs stock held on behalf of his creditors on January 3, 1974. A number of the items were recognized as fake by dealers present and were sold for a small fraction of the price they would have commanded if they had been genuine. John Fox was thought to have perhaps used, or caused to be used, a particular duplicative process, purposely un-named here, to manufacture the handstamp devices used in his fakes. This process could explain the near perfect nature of his fakes. Comparing the circle date stamp on the subject cover with a known genuine Concord, N.C. period cover dated April 17 shows only one difference. Although all letters are at the correct angle and location, including the date, there is an extra dot placed between the “C” of Concord and the “N” of N.C. This dot can be seen in Figure 2 and does not appear to be a smudge. It looks more like a flaw in the handstamp device that does not appear in genuine usages after the war. CONCLUSION: This is a genuine post-Civil War patriotic envelope, with a genuine U.S. 3 cent 1857-61 issue stamp added, that has been given a fake Concord, N.C. postmark and address.